Wuhoo! You’ve arrived at your new home with all your boxes! The hard part of all the intense planning, packing and moving is finally over. But that doesn’t mean your work is done; there are still a lot of things you’ve to do to make your new place ‘feel like home.’ Ideally, you should have cleaned and prepared your home before even moving in; however, if you haven’t done it yet, you can go through the list of things you should do at your new home, preferably right away. Celebrate the new beginning with a party! 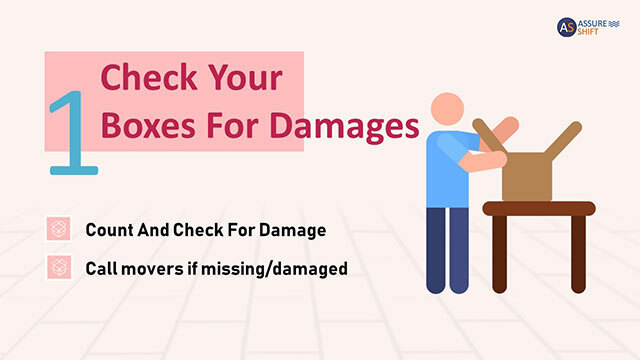 The first and foremost thing you should do as soon as your boxes arrive is to check them for damages and ensure all of them made it home. Therefore, it’s time to take out your inventory list which you made at the beginning of the move and tick off all the items that were delivered correctly. In case any items or furniture are damaged or missing, you should contact your moving company immediately to claim for insurance. If you delay this step, you may not get compensated for your losses. When you’re unloading all your household goods from the truck, it would help if you directly place all the boxes in their respective rooms. Hopefully, you had planned the layout of all the rooms during the pre-move cleaning, and you remembered to label all your boxes before moving them. Guide the movers to place the boxes in their respective rooms while unloading and make the process of unpacking easier. You don’t need to unpack the entire home in one single day, but you don’t want to leave it undone for a very long time either. 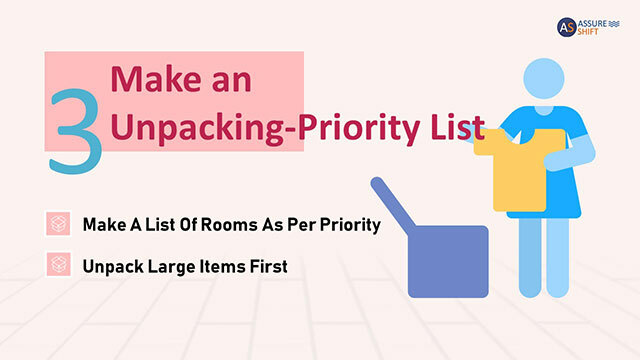 So, before you begin the process of unpacking you can make a list of the priority in which you want to unpack the rooms. For example, you could set up the bedroom first so that you can get a good night’s sleep. If you have kids, you can unpack their room and help them get settled in first. Or, you could start with the kitchen so that you have a nice place for you and family to eat. The sooner you unpack, the sooner it’ll help you get settled and feel more at home in the new place. The tried-and-tested method to unpack your entire home is to do it one room at a time. It’s better to have one room fully unpacked and arranged than 3 rooms half done. 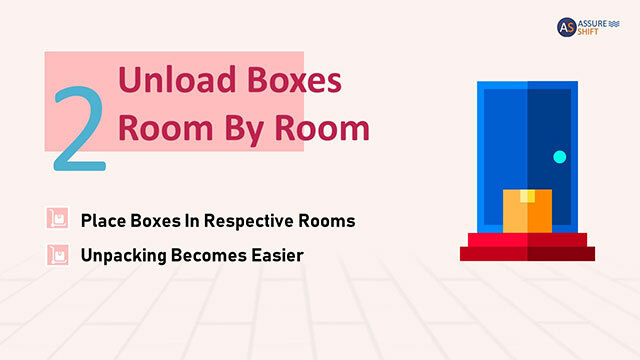 By following this technique, you’ll not only reduce the stress of having to unpack everything together but also get a chance to arrange each room to your liking. It’s like ‘hitting two birds with one stone’ and makes the process of unpacking much more interesting and fun. You need to check all your appliances and make sure they didn’t get damaged in the process of moving. 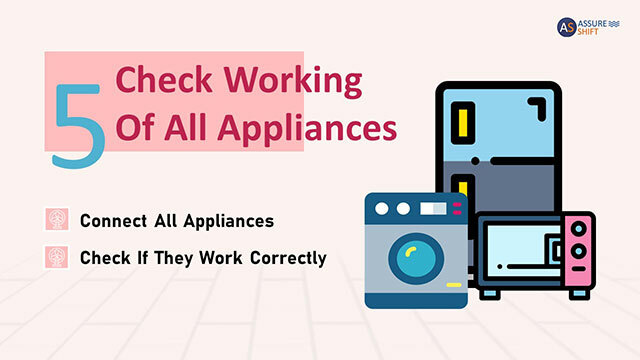 Connect and check if all the electronics and appliances are working correctly. In case of damages, you need to contact your relocation service provider and lodge a complaint or claim compensation. The quicker you check and identify this, the easier it’ll be for you. After you unpack and arrange all your things, chances are your home is going to get dirty again with dust being sprinkled all over the place. Just as you cleaned from top to bottom before moving in, you should clean the entire place even after you unpack. Although the post-move cleaning doesn’t have to be as intense as the pre-move cleaning, it’ll still ensure you have a clean start in your ‘newly arranged home’. Nothing’s worse than having to move into your new home without electricity or water supply. Or even internet connection! You were typically supposed to get your utilities connected a couple of days before you moved in. But, if it happened to slip your mind in all the hustle-bustle of moving, no worries! 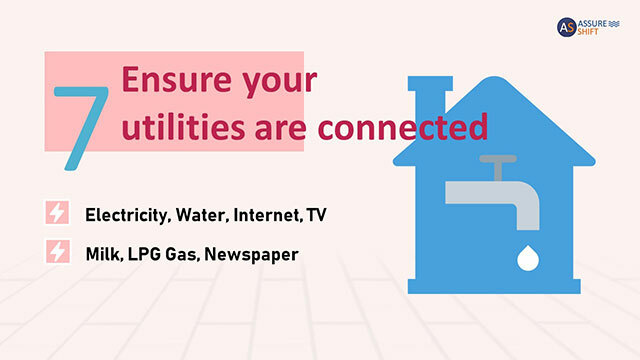 You can contact your utility departments immediately and inform them that you require the services to begin ASAP. Did your latest credit card bill come to your new home? What about this month’s magazine which you had subscribed for? No? That’s probably because you forgot to update your latest address at these places which communicate with you through mail/post. 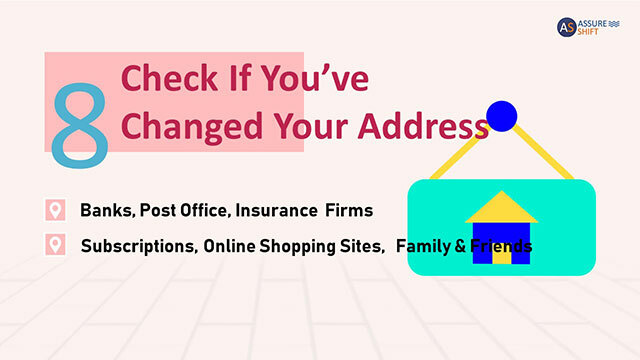 Now that you have unpacked and have a little time on your hands, you can quickly update your address in important places. To feel more familiar in the unknown environment, get to know the locality a little better. 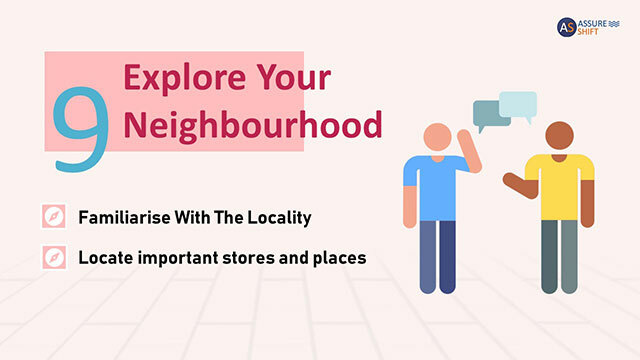 Go out and explore your neighborhood to find local grocery stores to do your weekly shopping, locate the nearest hospital, pharmacy, petrol station, and bike/car service centers. You could also take your kids to the park to play in and make new friends, and possibly find a pet-friendly coffee shop for your furry little buddies to socialize. Once you figure out where everything is located, you’ll begin to feel a sense of belonging and also help your family feel emotionally connected with the strange surroundings. 10. Celebrate the new beginning with a party! 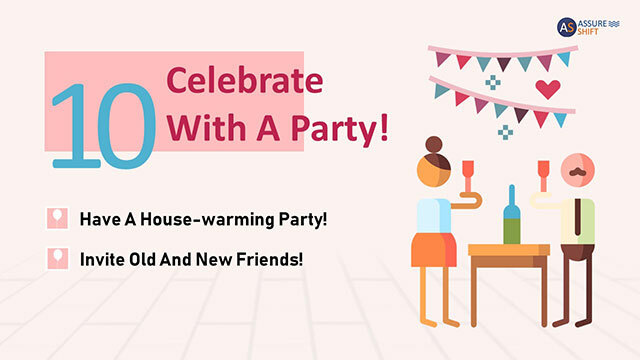 Once you’re all settled in and comfortable in your new home, you can celebrate all the hard work by throwing a party for your old as well as new friends and neighbors. It’s a great ice-breaker to get acquainted and become friends with your new neighbors (if you haven’t met them yet); and, an awesome reason to meet your old friends once again and show them how uniquely you’ve decorated your new home. As a bonus, you’ll probably receive some interesting new gifts to add to your collection of items! 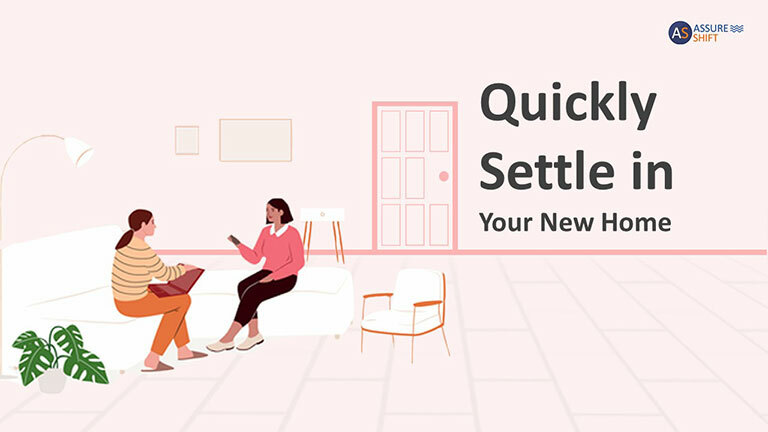 The process of moving out of your old home and into a new one can be emotional and stressful because of all the change you and your family has to go through. 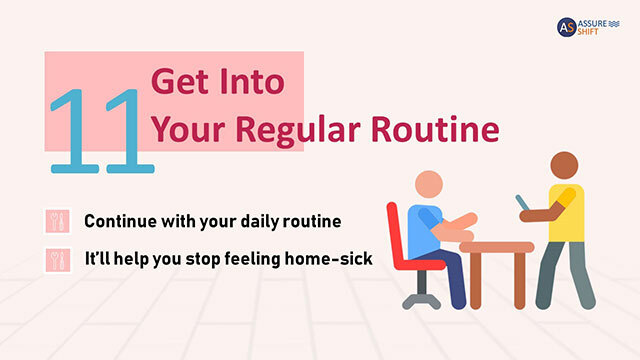 Instead of being stuck in the spiral of home-sickness, start getting into your daily routine as quickly as possible. Maintaining your family’s regular routine will help you feel as comfortable as you did in your old home, and make your new home a normal part of your life. No matter how hard you try to feel at home in the new neighborhood, it’ll be sometime before you really start getting used to it. Different people take different periods of time to adjust to a new place, so don’t worry if you’re feeling out of place in your new neighborhood. Things won’t always go as planned, but it’s better not to rush into any situation. Just go with the flow and remember to relax knowing you’ve done everything from your end to settle down. 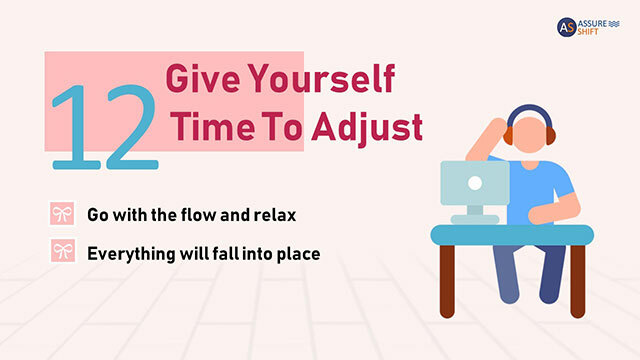 Give yourself some time to adjust and everything will fall into place. How to ensure a moving company is qualified to perform my move? 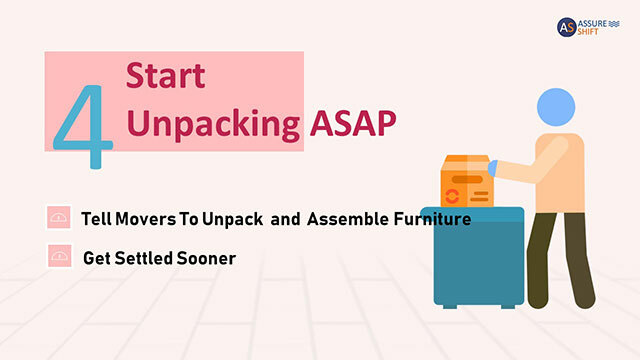 How to Find Best Packer Movers from Available Options?